As a parent I am always on the look out for experiences which will immerse the kids in nature. Getting them out and about exploring forests, rivers, the beach or the bush is our priority. 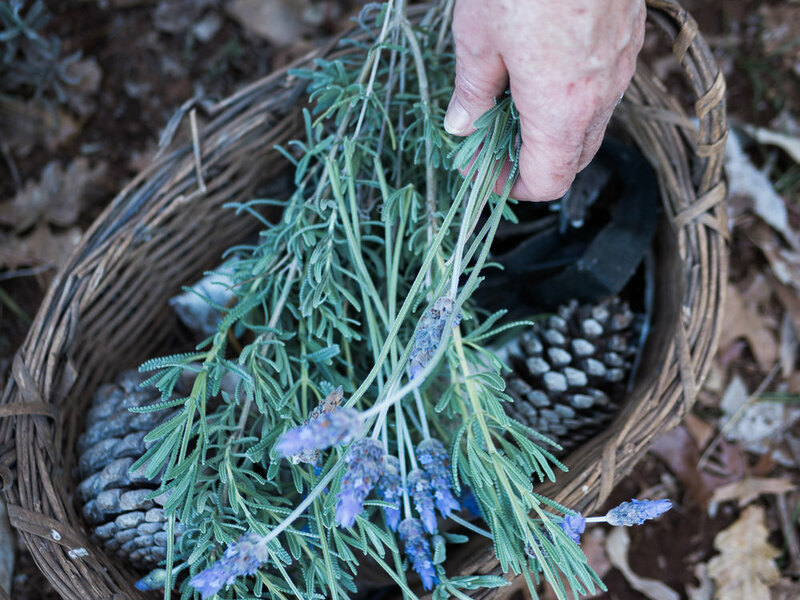 So when we stayed at Balingup Heights, a farmstay in Western Australia’s South West, it was such a beautiful and immersive experience I had to sit down and interview it’s owners - Deb & Brian Vanallen. Deb & Brian Vanallen moved to Balingup Heights almost 9 years ago. Jack gets some love from Deb. 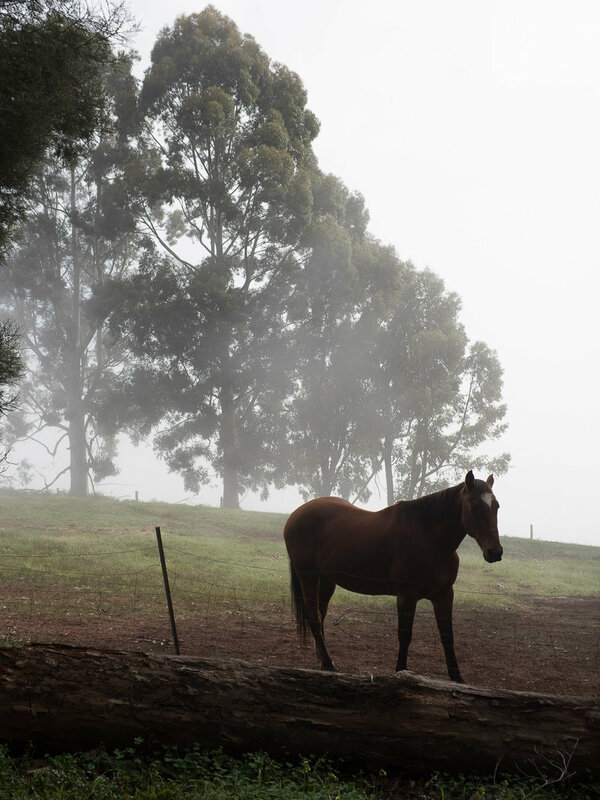 One of the things that makes the place so special is that Balingup and the surrounding Blackwood River Valley “is a little off the beaten track.” The area is nestled amongst “rolling green hills, quaint historical towns, fabulous local wine and produce” says Deb & Brian. Driving through Balingup in spring, the area is a lush intense green, a contrast to the dry brown hues of the West Australian bush. The road opens to a hilltop and when you drive through the gates of the farm the road winds past a persimmon orchard, rabbit holes and resident sheep wandering the paddocks. 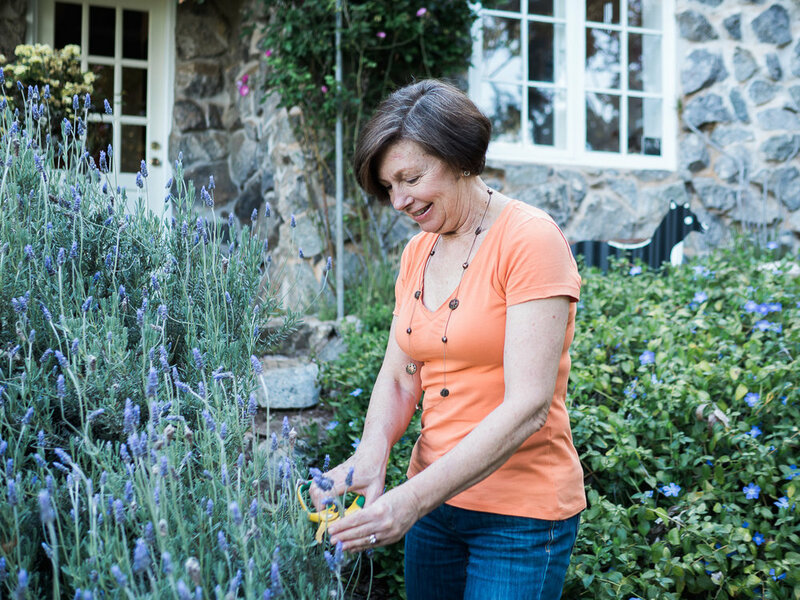 When I first arrived at Balingup Heights, I remember walking up the driveway full of flowers and garden trinkets, opened the front door and was greeted with the smell of chicken pie baking in the oven. I thought it was the perfect country weekend away. Lavendar, irises and roses grow in Deb and Brian's front garden. “We’re both easy going, like meeting new people and open to trying new things. A desire to ‘do something new’ was one of the main motivations for our move . . . and we’ve met plenty of fabulous people and experienced plenty of new things! 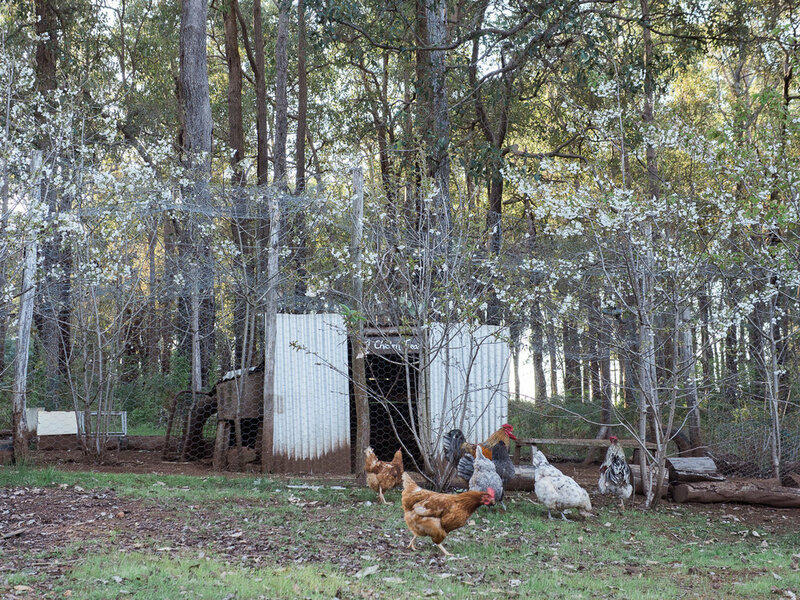 What farm wouldn't be complete without chickens. 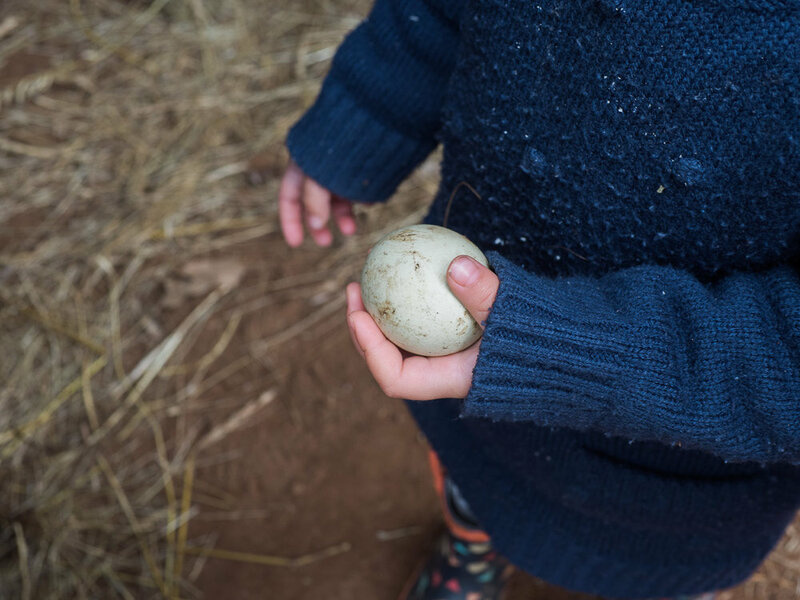 Collecting eggs is the highlight of any farm stay with kids. Jack the resident sheep follows visitors on their tour around the farm. Visiting the horses is the first stop on the morning feed. Deb and Brian take guests around the farm each morning to feed the animals. Morning sunlight and mist amongst the treetops. To Deb and Brian community means “feeling a sense of belonging, celebrating diversity, working together towards common goals, loving where you live, caring about the people, supporting each other through tough times or in a crisis.” They know they can ask for help when needed. 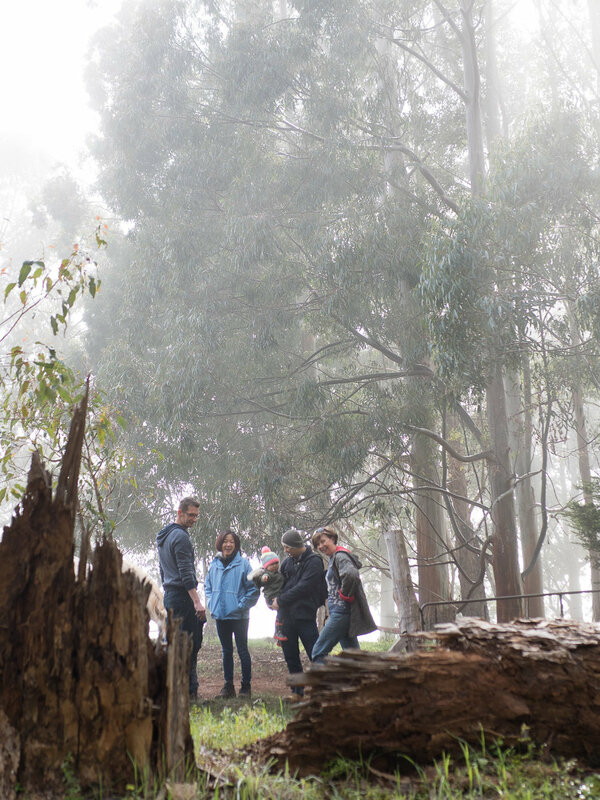 “Balingup and all of the surrounding towns have been extremely welcoming. We’ve never felt like outsiders or newcomers, in fact, our experience has been the opposite where the locals have always been delighted to see new people move into the region.” Balingup is a community that is close-knit. A community where everyone helps each other out, supports each other and gets involved.